This relatively flat plot is situated in an elevated position and affords views across to Loch Caroy and towards the famous Macleod’s Tables. 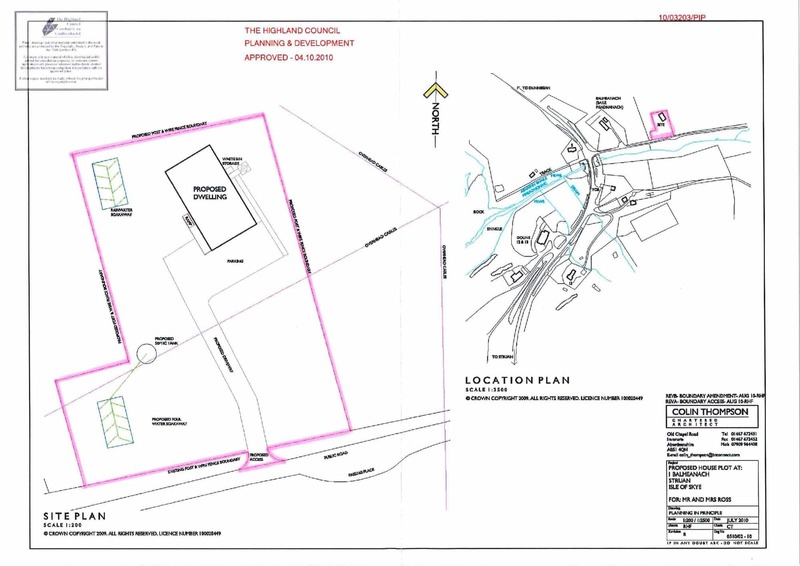 Access would be directly off the township road and this has already been formed, along with the site being leveled in preparation for works to commence. Electricity is close by and mains water is close by although permission does have to be granted to connect both of these. Drainage would be by way of a septic tank and soakaway. The plot has been de-crfoted and is ready to be worked on and the majority cleared the access road has been completed and is ready to use. At purchasers request the water track, electrical track, sewerage track and phone track can all be dug and back filled, and can be landscaped with top soil, thus ground works would be included in the price. There is a static caravan on site which can be made available by separate negotiation. Planning permission in principle has been granted on 4 October 2011 under planning reference 10/03203/PIP for the erection of a single story dwelling house, and has now expired. Balmeanach is a small, friendly community located some 3 miles from the village of Struan which is located on the West coast of the island and offers a small range of facilities including village shop, garage/post office, restaurant and primary school. More enhanced facilities including secondary schooling are available in Portree, the island’s capital located some 9 miles east of Struan. Portree also has all the services and facilities you would expect of a growing town including supermarket, builders merchants, cinema, good range of shops, hotels, bars, restaurant and a cottage hospital. The closest village is Dunvegan some 6 miles away which has good local services including shops, post office, primary school, village hall, medical centre, hotels and restaurants and the world famous Dunvegan Castle. From Portree take the A87 towards Dunvegan and Uig, turn left up the Struan Road B885 at the Howdens Industrial Unit. Travel along this road until the end reaching Bracadale. Turn right onto the A863 and continue on this road passing through the township of Ose and near Caroy. Upon the bed there will be a sign post directing you to turn right to Balameanach. The plot is located only a short distance along this road. £36000 (Fixed Price) and such offers should be submitted in proper Scottish legal terms to The Isle of Skye Estate Agency.